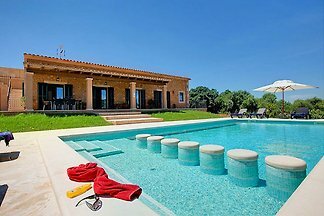 Set in Cas Concos, near Felanitx in the south-east of Mallorca, this rustic villa surprises with a private pool and welcomes 10 to 11 guests. This is a beautiful cottage with private pool, located in Cas Concos, a small urbanization in the municipality of Felanitx. It is perfect for 8 people as it has 4 bedrooms. We invite you to enjoy this impressive rustic finca for 8 - 10 guests, on the outskirts of Cas Concos, Felanitx. Spectacular finca with private pool in s'Horta (Felanitx) welcomes 10 guests. Rent successfully your holiday flat or holiday home in Cas Concos in only 20 minutes !